Just like when tunes are first composed, and lyrics penned later, a traffic cop’s nightmare begins only after infrastructure is opened to public use. In Bollywood nowadays, tunes are composed first and lyrics written later to fit the tunes. In a way, it is like digging a grave first and then looking for a dead body to fit the size of grave. Managing traffic after the opening of a newly constructed flyover or underpass in Bengaluru has glaring similarities. While the commuters suffer for a couple of years during the construction, the real agni pariksha for the traffic police and commuters starts after its opening. Neither has any clue as to how the traffic has to move. Whether there was any planning before the construction is a million-dollar question. Is the infrastructure a means to solve the transportation problems or an end by itself? Take the example of the Cantonment underpass. A day after the inauguration of its three vents which took more than eight years to complete, forget traffic police, even the agency which constructed the underpass had no clue which vent was meant for which traffic! Till date, no one has any clue except that the traffic police did some jugglery for utilising all three vents by a not so logical but out-of-box solution. The objective was to utilise the underpass, irrespective of whether it solves the traffic problem or not. The newly constructed flyover at Agara is another example where traffic on the top of flyover is not even 20% of the traffic going towards Koramangala below the flyover. The purpose of the flyover was to eliminate conflicting points, but the objective evaporated somewhere due to bad planning. As a result, the signal-free flyover is empty above and the signalised intersection below is jam packed. Have a look at the flyover at Iblur on Outer Ring Road and it is obvious that the planners forgot a road with huge vehicular movement into and out of Sun City. How a signal was designed for it by traffic police is nothing short of miracle. The strangest is the case of the underpass at Malleswaram which starts at a junction and ends at another junction. Worldwide, underpasses are made to cross the junctions without stopping. Here, a design is such that it would require a traffic signal in the beginning and also in the end. This means vehicles would be stranded on the up and down ramp of the underpass, thereby making mockery of an underpass. 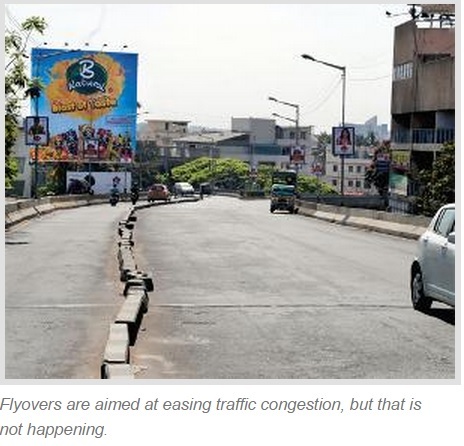 The day the BDA flyover was opened, it became a nightmare for the residents of surrounding areas, more specifically, of V S Raju Road and Serpentine Road, because the planners did not visualise (really?) that vehicles cannot turn at a right angle immediately after exiting from the magic box. The result was that the entire vehicular traffic was forced into residential areas, thereby adversely affecting the quality of the lives of residents. Agitation continued for months, blaming the police for something where they had actually no role in except ensuring utilisation of a badly planned infrastructure. K R Circle signal lights were removed to make it signal free by creating a huge rotary despite being contrary to the cardinal principle of transportation. If a rotary cannot work, one must put a signal and if signal cannot work, one must go for a flyover. Pursuing an obsession with signal-free corridors, despite protests from traffic police, the signal was replaced by a rotary. The aesthetics improved, but traffic was crippled. As expected, traffic police moved in and solved the mess by converting the rotary into a structure unparalleled in history, which approximately resembled a pendulum clock. Magic happened and traffic moved once again! But the biggest challenge was to use the Richmond Circle flyover which defied logic since its conception. True to its reputation, traffic police solved the problem by creating a signal on the top to allow traffic to cross, albeit creating a ‘first’ in the history of world. While there was huge criticism of the signal on the top, not many questioned the rationale behind the flyover design in the first place. Stung by criticism for years, traffic police searched for a solution to get rid of the signal without aggravating the traffic situation below the flyover. Even after six months of deliberations and half a dozen consultants, it reached nowhere. And when they were about to give up, the “eureka” moment came. One of the brilliant officers came up with the unthinkable: i.e. convert the one-way ramp into two-way for half the distance! After multiple measurements and putting medians in the centre, they did it! Signal was removed; traffic moved two ways on a ramp designed for one way! Wow! Once again they found a “dead body” to fit the “grave”! Well done, traffic police!